Updated January 1, 2017: Welcome to 2017, everyone! There’s a whole year ahead of us filled with exciting gaming opportunities, but there’s still time to reflect on the greatness of yesteryear. We’ve already done our fair share with the PCGamesN GOTY 2016 awards, but Steam have now thrown their prizes to the winds of the internet, revealing the winners of their publically voted Steam Awards 2016. For the end of year awards that really matter, here’s our staff-picked list of our favourite games of 2016. The awards covered twelve unconventional categories, and have been gradually voted on and awarded across the holiday period. The final day of the year saw the announcement of the last categories, and with the full picture now clear we can see that Euro Truck Simulator 2 and Grand Theft Auto V are the biggest winners with two awards each. Are these the winners you expected? Let us know your personal verdict in the comments. 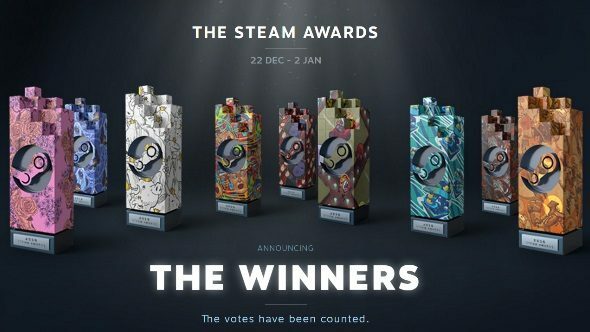 Original story: After the nomination period, the finalists for The Steam Awards have been revealed and honestly they’re all just a tad boring. Valve have completed ignored themass-voting for Half-Life 2: Episode 2as a game in need of a sequel, while most other categories have some fairly predictable inclusions from the 15 million strong squad of nominators. Now voting will begin for each, one a day from December 22 through 30. The Love/Hate Relationship Award – the Dota 2 award for being Dota 2, that game you hate but keep playing anyway because it’s fun to be stressed and mean. The Sit Back and Relax Award – when games are just nice to sit in. On. Around? The Better With Friends Award – presumably applicable to basically any game, ever, this is for those that get better with pals. Buddies. Chums. Soon-to-be-mortal-enemies. The rest of the nominations and dates for voting can be seen on the official announcement post. It includes such wonders as nothing from before 2007 being nominated for standing the test of time and two Far Cry games having huggable villains. You’ll be able to deliver swift judgement on these at 10am PST (6pm GMT) each day.